My little ones now drive cars, drink cocktails and carry ID but occasionally they still hanker for past times. When I suggested that I make some Easter nests they were very enthusiastic. Then I thought, actually those nests are fine, but my recipe makes 20 mini cakes and as adults perhaps we’d like slightly larger cakes but fewer of them? I toyed with using muffin cases for bigger nests but in the end decided to put the whole mix in a baking tin and cut the nests into slices. 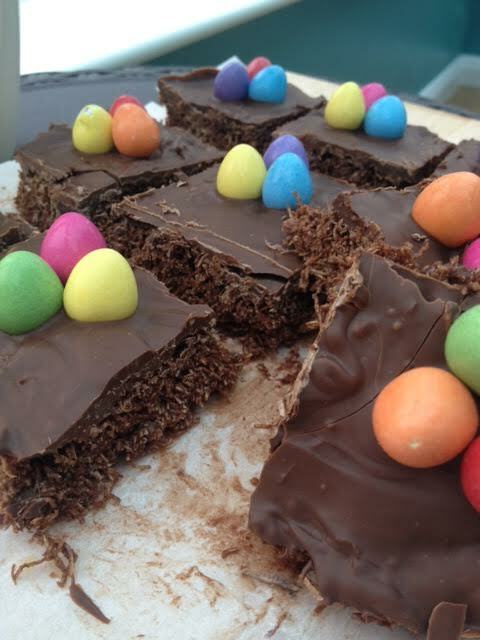 Don’t panic though the tops are still garnished with mini chocolate eggs. If you wanted to have slightly less chocolate, can’t see why myself but you might, those large rice paper daisies might look pretty on top too. 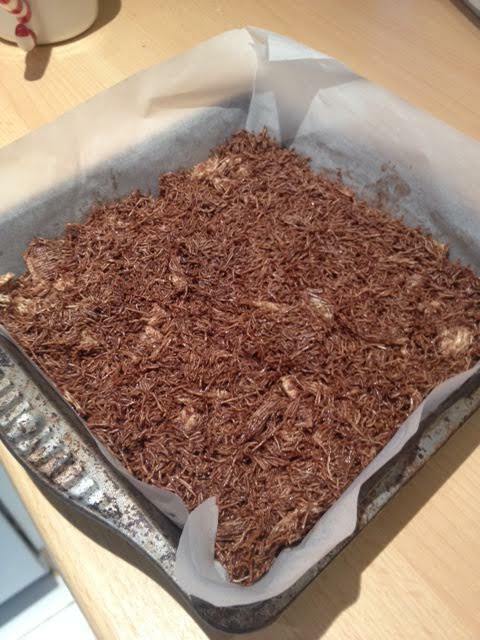 In a mixing bowl, using the end of a rolling pin, crush the Shredded Wheat into crumbs. You could use the fill a plastic bag and whack with a wooden spoon method if you want. In a large saucepan melt the butter, cocoa and syrup together to make a sauce. Pour the chocolate sauce onto the Shredded Wheat crumbs and combine thoroughly. Tip the chocolaty rubble into a lined tin and press down. Put into the fridge to set. Once set melt the chocolate and pour over the base. 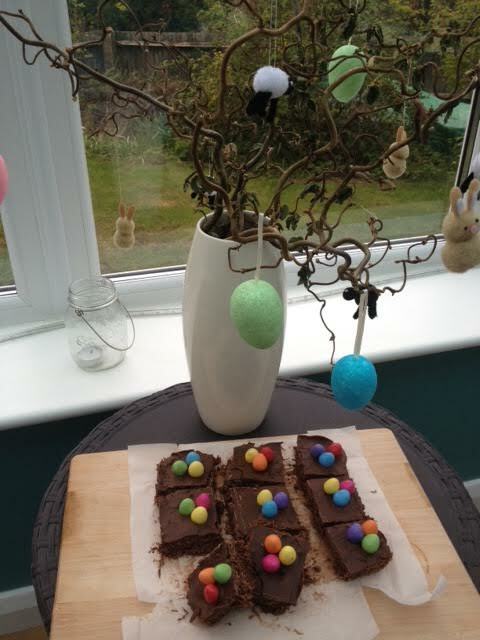 Decorate with mini eggs. Refrigerate once more until the chocolate is set. Cut into squares and serve. 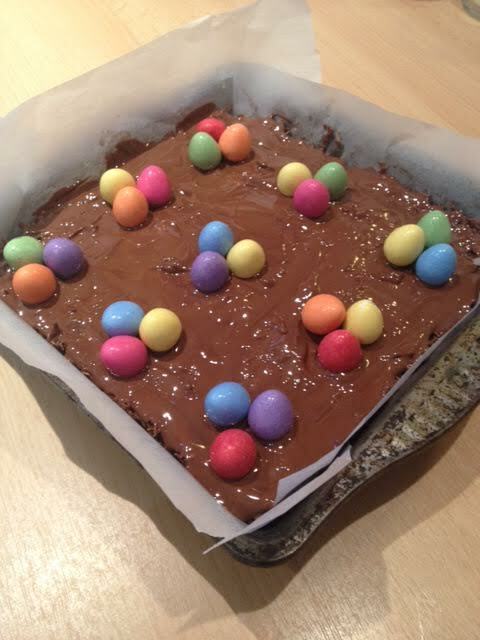 No birds or their nests were harmed in the making of this tray bake! ← Easter Baking at Mintcustard.